Huckleberry Finn (also called "Huck" for short) was a young boy in the 19-century USA. He appeared in a tall tale told by a singing railroad hobo. Huck and Tom Sawyer were given the task of painting a fence, but they managed to get the city's other young people to paint the fence for them while they wandered off to have some fun. Huck climbed on a fence and fall down, and after that was caught holding hands with Becky. Her father attempted to force him to marry her by in a shotgun wedding. Huck, however, dodged the wedding and went on the run with Tom, leaving Missouri for Missoura. However, they were chased by townspeople led by Becky's father and their families. They fled to a river boat, but were caught and for stowing away they were thrown overboard into the Mississippi River, where the townspeople caught them. The scene shifted to Tom's and Huck's funeral. Tom and Huck appeared to be secretly watching the proceedings from the rafters, until Reverend Lovejoy ordered their bodies lowered into the caskets, revealing that Tom and Huck were actually dead. 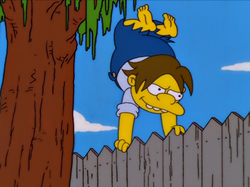 Huck also appeared in a daydream Bart had. Bart and Huck were floating downriver on a raft, and Bart said that it was "what being a kid [was] all about", when Abraham Lincoln appeared. Bart asked Huck what Lincoln was doing there, and Huck replied, "I dunno. It's your fantasy." As Lisa points out before the story begins, the story of Tom and Huck and the townspeople isn't an actual tall tale, but a story that the hobo tells based on Mark Twain's story about The Adventures of Tom Sawyer. Modified on February 22, 2015, at 12:08.